At Widdops, we provide a full range of consultancy, manufacturing and supply services for resellers, distributors and stockists. Our long-standing experience as a retailer and supplier means we understand the crucial things required to help support your client base. A swift turnaround – from placing your order, through to the fulfilment and quick delivery to meet with your customer expectations – are all important. This is something we continually strive for at Widdops – we want you to feel confident that your business can meet demand. We pride ourselves on our relationships with the companies who use us as an important part of their supply network, and do everything we can to help our resellers keep in the know with regards to the latest product information and developments. Our dedicated manufacturing facility in Bradford, West Yorkshire ensures we can be your one-stop shop, with our consultancy, design, prototyping, engineering and brush manufacturing capabilities allowing us to be as versatile as you require – a proposition that has cemented us as one of the most experienced industrial brush companies in the UK. Our strip brushes are incredibly versatile. We can manufacture and supply any length of strip brush in a wide range of materials, with a choice of trim lengths available. Whatever your business needs, we can help, thanks to the near limitless applications of the brush strip. 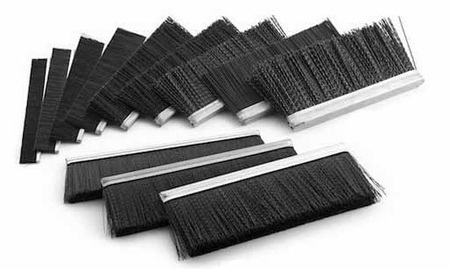 Some of the most popular uses for our strip brushes include draught-proofing, vent seals, cleaning, anti-vibration, shutter doors, recycling and waste management, skips, food processing, and conveyor machines. As a dedicated brush company, we can assist with any query to help you find the right solution. Our strips are protected from light, dust and dirt to improve their longevity. All our standard strip brush products are available with any of our standard filling materials, all of which come in a range of different thicknesses and colours. Brushes of most standard sizes can also be supplied with additional PVC clip-on or aluminium strip brush holders, including our standard three-metre-long aluminium holders and fabricated units of stainless steel or galvanised steel. For more information on our brush strips, or if you need some advice on which material will best suits your needs, please don’t hesitate to contact our sales team. We are extremely proud of our heritage as a UK brush manufacturer, and have built a solid reputation as one of the leading brush companies in the country with nearly 100 years of experience. We know how to provide the best quality products for our customers, and understand the very specific requirements and demands of the industries and sectors in which we operate.